About the Author: the writer has been practicing in homoeopathy for more than twenty years and at present; he is busy in tackling very serious cases those are, either being referred to the big and costly hospitals of the capital or set aside declaring them incurable. Many a case of uterine fibroid and other growths, malignant or benign have been cured with homoeopathic remedies. The writer claims that homoeopathic medicines may decidedly cure even the cancerous growths until the biopsy has been done. In his own views, the biopsy is never favourable to the patient because it is not a treatment, but merely a check-up against malignancy whether it exists in the particular part or not. In contrary, biopsy may, sometimes, become much harmful to the patient, when the infection that creates malignancy gets a way to come out of its limited area and spreads through blood stream into other parts of the body. According to the writer so many patients are still alive and living a normal life, whom he suggested not to go for biopsy before he treated them. Mrs. Smriti of 32, who always takes my treatment, told me about the abnormal state of her uteri that was, copiously, bleeding for more than two weeks, which had weakened her so much that many a time she was fainted followed by a severe cold sensation through vertebrae to the top of her head. We, just, were talking about the case, mean while, the recurrence of the same attack occurred so severely that she leaned upon her knees and then fell down. I asked my assistant for a folding cot and instructed her to rest giving two drops of Vipera-200 on her tongue that brought her senses back and she, soon, reached the normal state. In that duration, I observed all her symptoms minutely and knew rest of many others from her husband then I referred her for ultrasonic examination. 10. A boring pain over eyes and forehead from morning to afternoon and diminishes in the evening. Family background: She belongs to a medium-class but an ideal family. She is a government teacher and her husband is a sub-inspector police. They have two daughters only; therefore, they are anxious for a son. However, in such a position while she had been suffering from so many problems regarding her uteri how it was possible to conceive a male child for her, though, she conceived two times but aborted. Family History: Her family history was sound. Neither her mother nor her grandmother (maternal) suffered with uterine problems like her. Both of them delivered mature issues of sound physic. All her sisters, aunts (maternal) and cousins were quite O.K. in this regard. Now it was sure that her uterine fibroid did not succeed from heredity. 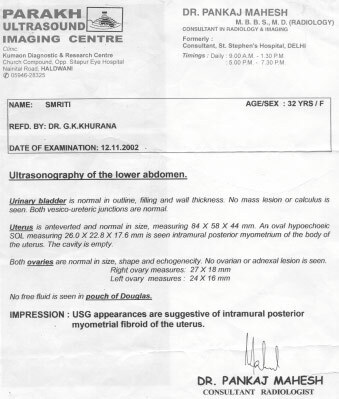 Diagnosis: All above symptoms were too enough to diagnose the case and to select a suitable remedy for her accordingly, nevertheless, thinking better I waited for the ultrasonic report that clearly confirmed an intramural posterior myometrial fibroid of the uterus measuring 26.0 X 22-8 X 17.6 MM. Mental State after being examined: She looked much worried about her disease and was afraid of its adverse effects as if, it might cause any serious injury to her womb. In spite of it, she hoped that she would get rid of the fibroid and being inspired of the faith, she never agreed to get it operated. In those days, she got slightly irritated and said looking. On November 13, 2002, two tablets (equal to five grain) of AMN 3X trituration were prescribed three times a day for four weeks. When she returned to my clinic after a month i.e. on 18 December 2002, I got the tendency of her physic toward improvement; therefore, I gave a slight break for two weeks managing the placebo in place of AMN 3 X . She told me that constant flow of the menses had been stopped within a day or two after the treatment began. On next turn AMN 3X again discontinued and placebo remained as it is. On January 20, 2003, she complained against the very problems, which had been subsided to a long time came back; Therefore, AMN 3X was repeated. Now, a two-week gap was kept permanently after every month treatment with AMN. In the vacant period (in two-week gap) placebo was given in place of the real remedy. 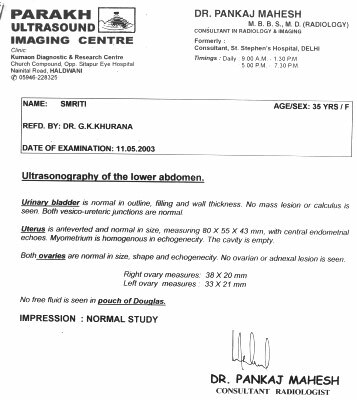 This system of treatment continued up to 10 May 2003 and then on 11.05.2003 the patient was sent again for ultrasonic revision that confirmed no evidence of the fibroid therein. Ultimately, after a long-termed treatment that continued at least for six months, Mrs. Smriti got rid of that bloody tumour. At present, she is living a hopeful life that in near future she would conceive and get a cute male baby. God may bless her ! To make the reports clear, please go to the views and click the zoom.